Airdrops are mainly distribution of tokens out to existing or new holders as a marketing strategy to promote a product, service, coin, or exchange. Of recent, this act has become increasingly important and as more people, especially new people, the need for a platform which will regularly publish these airdrops are required. Here are recommended platforms which you can get notified of airdrop events and know exactly what to do to partake of the token distribution. 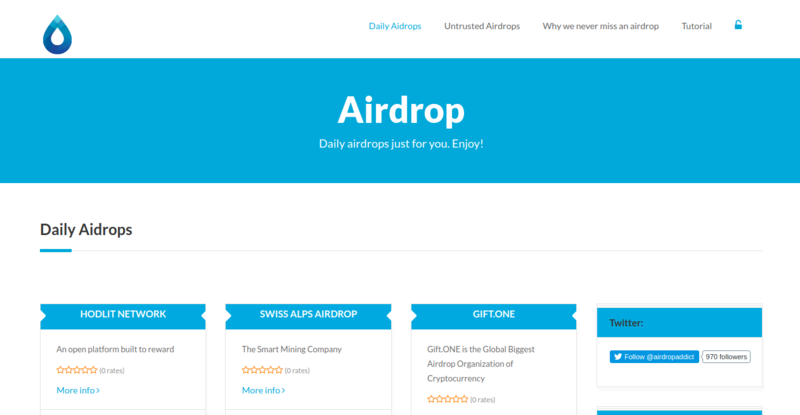 This crypto airdrop platform which was launched in 2018 has made a name notifying users of airdrops. It’s undoubtedly one of the best places to get information about airdrops, but more importantly, how to participate in them. Every information is made available to you, all relevant information to help guide through redeeming and also various news article around the airdrop on the web are published. The platform is easy to use; even a newbie can make his way around it. The team behind the platform, no doubt, has a lot of experience. The 99airdrops platform is spectacular in its workings. The algorithm behind the platform is developed to take into consideration every activity across the web, most especially Facebook, Reddit, and a host of others. These metrics are analyzed to know the validity of the airdrop program. The platform only gives out information about valid projects. In a bid to make the platform better, the 99airdrops site can make future price predictions based on specific criteria. The platform is one of the best and fastest platforms when it comes to notifying users on new airdrops. Their email newsletter subscription also is quite useful. Another way to get an update on the platform is by bookmarking the site and checking regularly. If you don’t have time to do this manually, then the first two options would be your best bet. The 99airdrops platform sorts upcoming events by time, at least, you get a 24hrs notice before airdrop starts to stay abreast forthcoming airdrop events. What’s more, the platform rewards its users with cryptocurrencies weekly. It’s no doubt that the platform is one of the best you can subscribe to for some extra free money. 99airdrops has all you need to know about cryptocurrencies in general. It’s the ultimate guide; all you need concerning airdrops. With AlertAirdop, you can get free coins almost on daily bases. Its many features make it much easier for cryptocurrency enthusiasts to follow. Just like the 99airdrops.com, this platform is also well designed and arranged. The airdrops featured on the site can be filtered based on current or ongoing events to those ending soon. Much more, this crypto airdrop platform has way more features compared to other airdrop platforms. Coin Airdrop is a dedicated site that’s regularly updated to give top airdrop announcements. Its clean interface gives users all they need to know about upcoming events and also information about claiming airdrops as well. New users to cryptocurrencies are not left behind, the site not only share airdrop opportunities but also educates new users to the cryptocurrency world adequate knowledge that makes them catch up with the rest of the world as quickly as possible. The platform is owned and ran by a cryptocurrency enthusiast known by the name Midas. You can support this platform by mining cryptocurrency for them with your computing power. This platform also makes the list of top trusted platforms where you are assured of accurate airdrop releases. The platform uses a ranking system to rate top airdrops and also separates the untrusted airdrops. It’s hard to miss out on any event as the countdown timer brings to your notice how much time is left to start. Twitter is one of the best places to get information on the web. This channel, on the other hand, is there to help amateur and experts on how to get crypto airdrops. This means the platform may not be in the position to give out details in a specific manner, but you can use it to keep an eye on latest airdrops available for any particular moment. Like there’s a Twitter app. Those who are not on Twitter or those who prefer to use the Telegram application to the twitter are also not left out. The platform guides users on each step to take before being a partaker. Even newbies won’t find it too difficult to follow, and with a little help, they’ll soon be reaching their best heights. You probably would think it’s just the Ether (ETH) and ERC-20 tokens that are regularly distributed. That’s not true. Though that’s the predominant cryptocurrency distribution as at right now, as project forks, sometimes, there’s a need to pass the token around and one of the best method, besides token sale is to airdrop it in participant accounts. Depending on what cryptocurrency you are looking to get, you might be needing a secure ERC-20 cryptocurrency wallet. A top choice that comes to heart would be the MyEtherWallet. Nevertheless, if airdrop isn’t a token that’s ERC-20 compliant, there’ll be information on how to get the needed wallet. Airdrops are certainly not ways to make fast money, but over time, you may see those coins which were worth almost nothing at token distribution phase worth thousands of dollars in coming years as the platform which it’s meant to run on continues to grow.